Brush griddle or skillet with vegetable oil, or spray with cooking spray. Heat over medium-low heat. In medium bowl, stir Bisquick mix, milk and eggs with whisk until blended. Pour onto griddle by tablespoonfuls to make silver dollar-size pancakes. Cook until edges are dry. Turn; cook until golden. 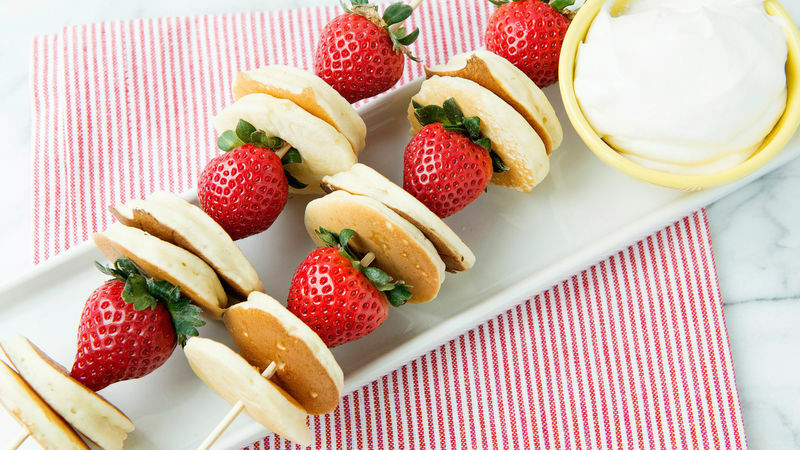 Thread pancakes and strawberries onto skewers. Serve with whipped topping for dipping. Use peaches, pineapple, or whatever fruit you desire to make your kabobs. For a heartier version, alternate pancakes with pieces of cooked sausage links. You could also serve jams and jellies for dipping for variety.